The Zen Tour is a Compact Recording Interface With 8 Analog I/Os Features a Host of Tools for Bands, Performing Artists and Musicians, Including Top Flight Guitar Amp and Cab Simulations. While the Goliath delivers 64 Channels of Simultaneous I/O — Leveraging Thunderbolt™, MADI, USB Connectivity Options and Exclusive Guitar FX Modeling Plug-In Functionality. Frankfurt, Germany, April 7, 2016 — High-end clocking and conversion expert Antelope Audio [Musikmesse: Hall 9.1, Booth D33] is set to revolutionize the portable interface market with its most accessible and versatile recording tool to date: Zen Tour. 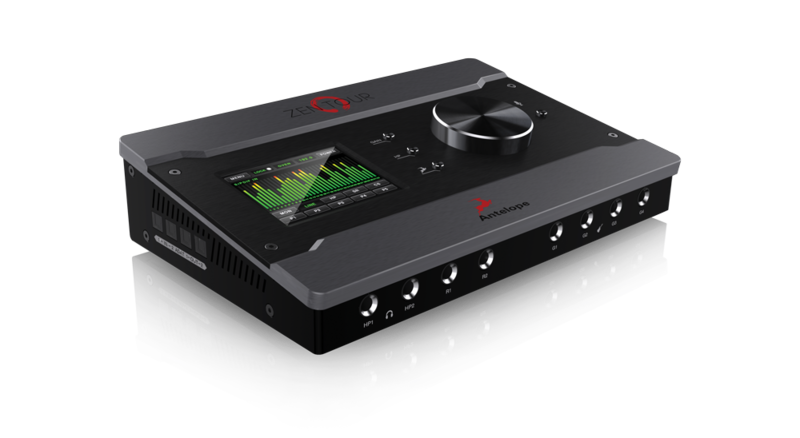 Zen Tour, which debuts at Musikmesse, features an ultra portable form factor, Thunderbolt™ and USB connectivity, 8 analog inputs and outputs, high-end DSP effects, hardware-based guitar amp and cab simulations and more — making it the ultimate creative recording tool for musicians and bands. With Zen Tour, there are no more boundaries to achieving great recordings. With 8 inputs, including 4 switchable Mic/Line inputs and 4 HiZ/Line inputs, Zen Tour provides plenty of options for tracking several instruments simultaneously — as well as digital ADAT & S/PDIF I/O for increased connectivity options. Zen Tour’s 8 outputs are carefully designed to enable an all-in-one workflow, at home or on the go. Dual independent headphone outputs enable two musicians or a musician and engineer to listen in without additional hardware. Dual monitor outputs enable A/B monitor switching, making it easy to reference mixes on two different systems. Dual reamp outputs provide incredible versatility for guitarists and other recording artists — whether tracking guitars direct in a hotel room and then rerecording a performance through a tube amp back in a home studio, or applying high-quality effects to manipulate a vocal mix. A talkback button on the front panel keeps Zen Tour at the core of your home studio setup. Zen Tour incorporates the same parallel DSP processing capabilities found on Antelope Audio’s professional studio devices, enabling incredibly low recording latency as well as the use of Antelope’s groundbreaking hardware-quality effects. These include guitar amp and cabinet simulations, the classic Pultec EQ, and the powerful AuraVerb reverb. These tools can effectively replace thousands of dollars worth of outboard gear and amplifiers. With the incredibly low latency of Antelope’s Field-Programmable Gate Array (FPGA) processing, guitar amplifiers respond with the same immediacy of real tubes, carrying an authentic tone and realistic sound. Antelope Audio continues to innovate in software-based hardware control with Zen Tour, with an impressive touch screen, a handy mobile app, and a cross-platform software control panel. With its networking and remote control implementations, users are able to manage all Zen Tour features from multiple computers in the same network as well as from a smart phone or tablet thanks to the iOS and Android mobile apps. Zen Tour combines many of the features that have made Antelope Audio a leader in recording innovation in an aesthetically attractive and compact form. With tools for tracking, mixing, and processing, Zen Tour's uncompromising audio quality makes it a best-in-class interface for bands and musicians who want to create professional quality recordings that reflect their musical visions. Frankfurt, Germany, April 6, 2016 — At this year's Musikmesse, leading professional audio manufacturer Antelope Audio [Booth #33D, Hall 9.1] is shaking up the world of professional interfaces with its new Goliath — a towering innovation with 36 analog inputs, 32 analog outputs, 16 Class-A microphone preamplifiers and Antelope's renowned clocking technology: all packed within a 2U rack space unit featuring Thunderbolt, MADI and USB connectivity. Goliath offers two MADI ports with a total of 128 MADI channels or 64 channels per port. The Goliath features custom built-in DSP effects and several modern and vintage hardware EQ and compressor models, bringing the ultimate in both features and usability to the most discriminating recording applications. "Goliath represents a revolutionary turning-point in modern interface technology and is the culmination of years of research and engineering," commented Igor Levin, founder and CEO of Antelope Audio. "Gone are the days of proprietary interface technologies that delivered inadequate performance and quality at an exorbitant price per channel. With Goliath, which features unmatched channel counts, flexibility and connectivity options, Antelope brings world class recording capabilities, inspiring creativity like never before." With 64 channels of Thunderbolt™ connectivity, a vast array of routing options and sophisticated software and DSP capabilities, users are able to exert more creative control over their recordings than ever before. In addition to its pristine, commercial-grade AD/DA converters, Goliath also features 4 superb instrument DIs and 2 transformer Reamp outputs on the front. The unit also features 24 line level outputs and 16 line inputs, all on DB25 connectors — making it ideal for tasks requiring hardware inputs or summing. Combined with this impressive feature set, the addition of 16 channels of Class-A microphone preamplifiers makes Goliath more flexible, capable and expressive than any other interface on the market. As with Antelope's other new interfaces, Goliath employs Antelope's powerful FPGA-based DSP engine, enabling it to process four zero-latency mixers with custom effects. These effects include the stunning new AuraVerb reverb, along with several other modern and vintage hardware, EQ and compressor models. Antelope's RealModel technology helps create the most accurate modeling of components, creating an authentic sound experience of classic analog gear. To ensure clocking stability and crystal clear performance, Goliath utilizes Antelope's proprietary Acoustically Focused Clocking (AFC) jitter management algorithm and oven-controlled crystal oscillator — the same clocking technology used in top mastering studios around the world. With intelligent, tactile controls and a supremely intuitive software user interface, Goliath places full creative control and easy operation in the hands of the user. The physical unit includes dedicated knobs for mic pre gain and instrument inputs, as well as large, assignable knobs for stereo, surround, or headphone monitor outputs. There are also dedicated buttons for talkback, mono and mute, as well as a flexible 'Antelope' button. Goliath's included control software enables users to easily route any input to any output using a color-coded routing matrix, which also allows users to save up to five presets. Using the system's iOS and Android compatible applications, users can easily go wireless — making it easy to stay in command of Goliath's robust feature set at all times. The Goliath will be shipping around the end of May, 2016 and will carry a price of $4,995/€4,900.